Service Nation Alliance Holds Int'l Leadership Workshop. Members of Service Nation Alliance, a new contractor alliance brought to you by the same people who brought you Service Roundtable, participated in a leadership workshop led by legendary contractor Ron Smith in Frankfurt, Germany. The workshop was held in conjunction with ISH, the world’s largest bi-annual tradeshow for plumbing, heating and air conditioning. ISH brought thousands of exhibitors and over 200,000 visitors. “It’s hard to put into a few words how impressive ISH was,” said Alliance member Steve Lauten, president of Total Air. “It’s the granddaddy of all trade shows in size with 20+ buildings of things to see.” Smith agreed. “The ISH show was incredible and nearly beyond description,” he said. Alliance members, including Lauten and Smith, attended the conference to source potential products, seek out ideas, see new innovations from other countries, and study global installations and product practices. “We saw hundreds of state-of-the-art products including many that we never knew existed,” Smith said, adding that Alliance members seemed particularly interested in renewable energy and controls. 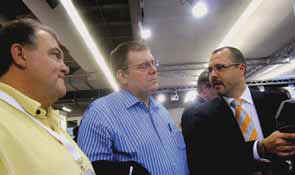 Members plan to elaborate on the ISH show at the Spring Roundtable in San Juan, Puerto Rico in May. Service Nation Alliance is HVAC’s newest high level alliance focused on providing exit strategy options, developing documented systems, best practices and procedures. For more information, call (877) 262-3341 or e-mail Alliance@ServiceRoundtable.com.